matthias gommel’s “delayed” | Abler. 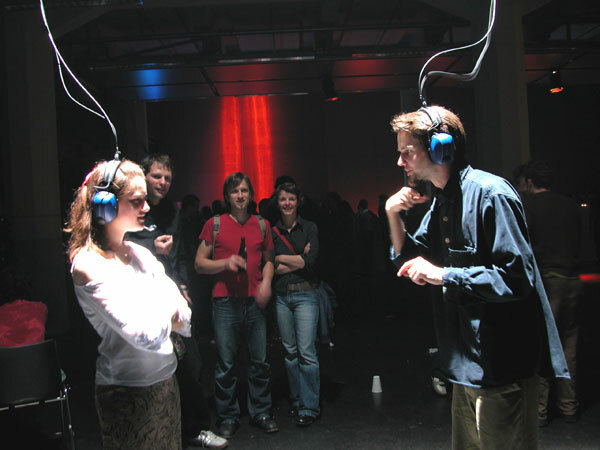 Matthias Gommel’s Delayed places two participants in conversation via headsets–except their communications are postponed for five seconds. No instructions are given when you encounter this work; it’s a game of trials and tests and repeats. It’s striking to me that this piece originates from 2002, precisely when it would have registered most strongly around the can-you-hear-me-now ubiquity of mobile phones and their attendant stuttering rhythms. In one way, it’s a work located in that exact year. But in the museum context, like this show at SFMOMA from 2009, they become an additional performance as well.